On 25 January 2019, Greek Parliament ratified the Prespa Agreement between Greece and Macedonia, according to which the latter country will be renamed to the Republic of North Macedonia. Two days ago, Permanent Representatives of the 29 NATO members signed the Accession Protocol with Skopje. In a recent interview for television N1, Macedonian Prime Minister Zoran Zaev expressed his expectation that Macedonia will become a member in 2019. This would make Macedonia the second country of the Western Balkans to join NATO in recent years, after Montenegro, which became a member on 5 June 2017. What is the situation with Serbia? In an interview for our portal, Branimir Filipović, Assistant to the Minister of Foreign Affairs of Serbia in charge of security issues, clearly pointed out that the country will remain neutral and will not join NATO. Despite that fact, it will continue to work closely with this organization in many different fields. This leaves Kosovo and Bosnia and Herzegovina as the only countries in the Western Balkans that might become the next NATO members, since Albania joined the Alliance in 2009. However, in spite of many years of cooperation with this organization, both countries are facing their own challenges that hinder their possible integration. NATO has been present in Kosovo for almost 20 years. In June 1999, after an air campaign against FR Yugoslavia, NATO established the Kosovo Force (KFOR). KFOR is represented in Kosovo by the international peacekeeping forces led by the Alliance, with the aim of maintaining order and peace, that is creating security in Kosovo after the conflicts and retreat of forces of Yugoslavia, i. e. Serbia. It derives its mandate from the UNSC resolution 1244 (1999) and the Military-Technical Agreement between NATO, the Federal Republic of Yugoslavia and Serbia. “In the past two decades, the KFOR mission has been active in Kosovo, being perceived as the key security provider alongside Kosovo’s newly established security institutions. However, KFOR mission is an operative and active NATO presence in Kosovo, while the political dimension of enhancing cooperation with NATO and moving forward the membership pathway has been considered as a very challenging process for Kosovo”, says Donika Emini, Researcher at Kosovar Centre for Security Studies. Kosovo Government has shown extensive political willingness to enhance cooperation with NATO and climb up the membership ladder, but to date there is very limited progress in this regard. On 11 July 2012, Prime Minister Hashim Thaçi submitted a request for Kosovo to join Partnership for Peace (PfP) programme in Pristina, which would establish a formal partnership between Kosovo and NATO. However, one of the key obstacles in this regard can be attributed to NATO’s neutrality approach towards Kosovo’s statehood due to the fact that four NATO members (Spain, Greece, Slovakia and Romania) have not recognized Kosovo’s independence. In contrast to the EU integration process for Kosovo – in which, in spite of all challenges, there are cases of internal consensus towards Kosovo, the progress made in relation to NATO integration has been even more limited, points out Emini. 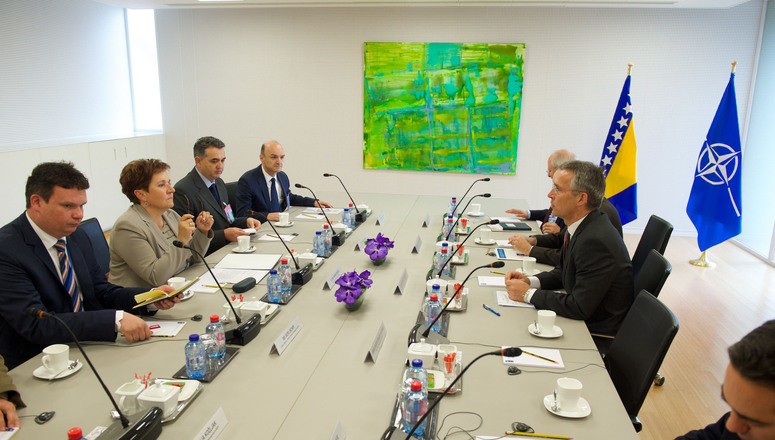 „The resistance from the non-recognizers – with Spain being the most vocal in the group against Kosovo – was noticed during the period of time in which NATO was preparing the response to the letter of Kosovo’s Prime Minister of the time, Isa Mustafa, who demanded an enhanced cooperation with NATO”, explains Emini and adds that Kosovo-Serbia dialogue is the key and that NATO is waiting for the outcome of this process before making any further steps. In December 2018, the Kosovar Prime Minister Ramush Haradinaj stated that Kosovo will apply for NATO membership after the formation of the Kosovo Armed Forces. Before him, Kosovar Minister of Foreign Affairs Enver Hoxhaj stated that the goal of Kosovo is to become NATO member by 2022. Emini reminds that the only upgrade of relations between Kosovo and NATO took place in 2017, following the letter sent to Kosovo’s Prime Minister by NATO Secretary General in December 2016. This letter, which was considered to be ambiguous and offering far less than the Government of Kosovo expected and demanded from NATO. Nevertheless, this letter offered a first small step in initiating cooperation between Kosovo and NATO. “The new level of interaction does not imply that Kosovo-NATO interaction will take place directly from the NATO Brussels HQ, but that it will be managed using the KFOR presence in Kosovo and the NATO Advisory and Liaison Team (NALT) in Kosovo”, says Emini and adds that, in the framework of the new cooperation scheme, an increased interaction is expected to take place, enhanced communication and increased visits of the NATO’s senior officials to Kosovo as well. Furthermore, the “enhanced interaction” will clearly not give Kosovo full access to all programs that NATO offers to its partners, but it will allow Kosovo to benefit from some programs such as Building Integrity Program, Public Diplomacy Division, NATO Science for Peace and Security Program, etc. Things became complicated after Kosovar Parliament adopted three new sets of laws in order to form Kosovo Armed Forces. Initiated in 2012, the transformation of the KSF has been brought on the agenda many times in the past years, as it is a necessary step toward completing the security architecture in Kosovo. “The change of mandate which will place the KSF in a ten year transitioning period has triggered many debates and reaction from NATO, with some of declarations even considering it as a threatening step toward NATO-Kosovo already fragile relations and a step backward for the Atlantic perspective of Kosovo”, says Emini. NATO has had concerns about the move, which was clearly stated in an recent interview with the James Appathurai, NATO Deputy Assistant Secretary General for Political Affairs and Security Policy. Appathurai confirmed that words of NATO Secretary General that the process was “untimely” and that NATO is concerned that it would not lead to greater stability, potentially on the contrary, and that this was not the right time to take that step. However, Donika Emini thinks that a potential Kosovo accession to NATO will have a positive impact on Kosovo and the region. “NATO membership would fulfill one of the key foreign policy objectives, it would list Kosovo among its partners’ part of the alliance. Moreover, it would give Kosovo the unique opportunity to transform itself from a security consumer into a security provider – being a host country for the KFOR mission, Kosovo would surely have a lot of experience and know how to share through various international peacekeeping missions”, explains Emini, adding that intensification of cooperation in the security sector would be the key benefit from NATO membership and it will decrees possibility for other external influences to penetrate in the region. Unlike in Kosovo, where there is a clear will of all political actors and population for the country to sooner or later become part of the Alliance, in Bosnia and Herzegovina the situation is far different and complicated in its own way. NATO began its engagement in Bosnia in 1992, first through airspace control, and later it culminated with the Operation Delibarate Force, which lasted from 30 August to 20 September 1995. However, the BiH Presidency voiced its desire to join NATO in June 2001, during the visit of the then NATO Secretary General Lord Robertson, who pointed out the numerous reforms that BiH must take on this path. BiH was invited to join the Partnership for Peace program on 29 July 2006 at the Riga Summit, and on 14 December the same year BIH officially became PfP country. Cooperation with NATO was further deepened in September 2008, when the first (and only) Individual Partnership Action Plan (IPAP) was agreed with the Alliance. This plan, which is unique for each individual country, consists of different areas and mechanisms of cooperation between NATO and individual country. The agreement is considered the last step before launching the mechanism for joining Alliance. For example, Serbia, which does not plan to become a member of the organization, has adopted its first IPAP in 2015, and is expected to adopt another one this year. In 2009, the chairman of the BiH Presidency at that time – Nebojša Radmanović from SNSD party submitted the application for Membership Action Plan. The country was invited to join Plan in the following year. Membership Action Plan is a program of partner cooperation between NATO and a country aspiring to become a NATO member. Allied Foreign Ministers have decided in 2018 that NATO is ready to accept the submission of Bosnia and Herzegovina’s first Annual National Programme. Now, it is up to the Council of Ministers of BiH to adopt and submit its first Annual National Program to NATO Allies, in order to activate the MAP. “No country is able to deal with all contemporary security threats alone. That is the reason why the Presidency of BiH has adopted General directions and priorities for implementation of foreign policy of Bosnia and Herzegovina, which expressed that the main foreign policy goals of Bosnia and Herzegovina are membership in NATO and EU – already in 2003. The same goals have been confirmed again 15 years later, in 2018, when BiH Presidency adopted the Foreign Policy Strategy of Bosnia and Herzegovina 2018-2023, in which the activation of the MAP is declared as one of the two main foreign policy priorities. BiH leaders just need to act in accordance with official strategic documents of the state of Bosnia and Herzegovina”, explains Damir Duran, President of Euro-Atlantic Action. He thinks that there are numerous reasons for BiH to join NATO, the main ones being the elimination of the possibility of war and attracting foreign investments. “With the integration into the Alliance, Bosnia and Herzegovina would come under NATO’s security umbrella and this would remove possibilities of another Bosnian war in the future, since NATO member countries have never experienced wars on their territory after they have joined NATO. When a country is secure and stable, that external and internal security attracts inflow of foreign direct investments into a new NATO member country, as we can learn from experiences of Poland, Czech Republic, Slovakia, Hungary and others”, says Duran and adds that, as a NATO member, BiH would have a chance to experience the same benefits of NATO integration as other members like former socialist countries. However, recent statements by position and opposition leaders from Republika Srpska do not give hope that BiH will soon submit its MAP. Firsty, Milorad Dodik, a member of the BiH Presidency and president of the SNSD Party, said that “Republika Srpska does not have the readiness and support to become NATO member” and that they do not trust the Alliance. And then the president of the opposition SDS party, Vukota Govedarica, statedthat [Republika] Srpska and the Serbian people have nothing to do in the NATO alliance, and that they will follow all the moves of Serbia and decide on further steps about this issue with this country. “I know that some politicians now have the objections to MAP activation. I don’t understand why, though”, states Duran. He points out that among other things, it is expected from BiH to settle its international disputes by peaceful means, to demonstrate commitment to the rule of law and human rights, to settle ethnic disputes or external territorial disputes including irredentist claims or internal jurisdictional disputes by peaceful means in accordance with OSCE principles and to pursue good neighbourly relations. “How can anybody have any objections to such requests? Through MAP Bosnia and Herzegovina will prepare itself for improvement in the areas of politics, democracy, rule of law, economy, fight against corruption, freedom of media. Why should anybody have any objections to such improvements that will lead to prosperity in BiH?”, concludes Duran. Duran thinks that lack of knowledge about the effects and benefits of NATO integration as the main challenge for Bosnian accession to NATO. He thinks that there are a lot of misconceptions and disinformation about NATO in BiH, and adds that it is very important to have a dialogue about integration, but dialogue based on facts, security and economic indicators, as well as experience of other NATO member states.